Thanks everyone for your advice on destashing. I decided to list a a few things on Etsy and do a giveaway. If you are interested in the Etsy destash, you can find my shop here. I had intended to do a giveaway when I reached 1000 Bloglovin followers, but I am currently at 963 followers so this will have to be the I'm-almost-to-1000-Bloglovin-followers giveaway. If you would like to help me reach 1000 followers, you can find me here. And now for the giveaway. When I first started quilting I tended to buy larger cuts of fabric (now I usually buy 1/4 yard cuts, occasionally 1/2 yard if I really like something) and so I have quite a bit of fabric leftover from past projects. There are some larger cuts here (four or five of them are a full yard) and some smaller scraps (including scraps from most of the Nordika prints). But designers range from Amy Butler to Denyse Schmidt to Joel Dewberry and several Moda designers. If this doesn't end up filling the flat medium rate box I will add more from my stash until it is stuffed full. I like all of these fabrics but I just don't know if I will ever use them, so I would like them to go to someone who can use them. If you would like to enter the giveaway, just leave me a comment. No hoops to jump through, I just want the fabric to go to someone who needs it. The giveaway will go through Thursday evening and I will announce a winner on Friday. Because of the high price of shipping I am going to limit this to US entries only. I'm sorry I know that's lame, but shipping is expensive and fabric is heavy! p.s. The first FIVE people to comment to this post were all no-reply bloggers which means that I cannot contact them if they win. If you aren't sure if you are a no-reply blogger, please check here or leave your email address in your comment. Wow! What an awesome destash! Thanks for the chance! Awesome! Love your fabric! I would love to win! I LOVE sewing and my fabric stash is pitiful. My entire stash fits in a shoe box! Sad I know.. Thanks for the chance to win! Crossing my fingers! Thanks for the chance. They are beautiful fabrics. PS: love the 'staches in the Etsy shop listings. That's a fantastic box of goodies! I would love to win! That would make nice doll blankets for 18 inch dolls...Thanks for the chance to win! Love destashes because it lets someone else be creative. Hoping it will be me! I'd love to make a patchwork weekender bag with those Nordika pieces! beautiful fabrics! thanks for a generous giveaway! Love destashes and scraps! Lots if fun possibilities! Thanks for sharing. Good idea for fabric de-stashes! Thanks for hosting the giveaway as well as the no-reply blogger info. Great fabrics! I would love to win. Both my daughter and I are getting into quilting. I'd love some fabric... Thanks for the giveaway! Fabric! And I saw some prints I loved & never bought/used up! Oh i would love some fabric. Can't afford to buy anything right now. Thanks for your generosity! Just checking out the fabrics for your giveaway. I love the variety. Ahhh, how much would I love to win this? (a lot) :) Thanks for the chance! Awesome giveaway! I'm going to check out your destash, too :) thanks! I know that I'm not a no-reply so if you randomly select my number, I'll be waiting. Going over to Etsy now. These are all beautiful! They even look like you stacked them to coordinate in the photo. You have such a great sense of color. :) Thanks for the chance to win these! I love scraps and am working on using mine for hexi flowers so these would be added right in. Thanks! Wow, there are some amazing fabrics in there. I wouldn't say that I NEED them but I'd definitely love to have all of it :). Thanks for a chance to win! Looking forward to the day I need to destash! Oh I would love to win this :) That green print with the cars is so adorable, and my son would love it! Whoever wins this will be one lucky person. I can't resist scraps, and yours are lovely. Just in case... seelifemarvels at gmail dot com. Thank you. Here's hoping you reach 1000 soon! Wow...love the destash!!! Thanks for the chance! 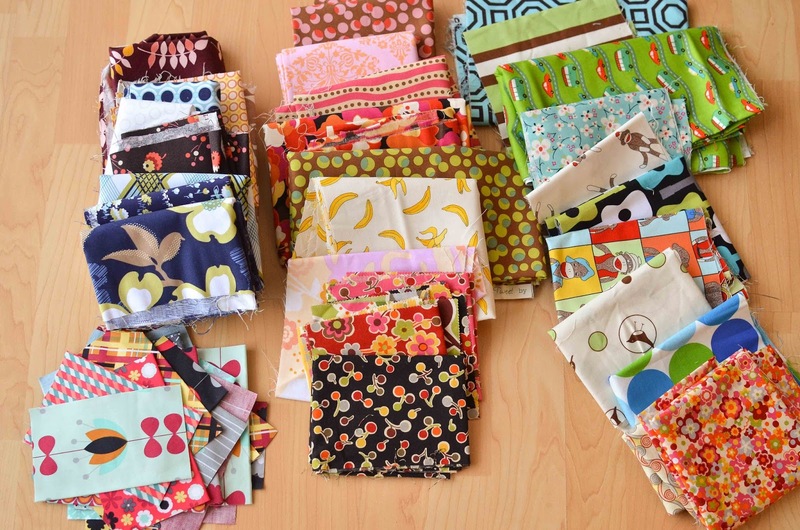 These are great destash fabrics! I hope I win! Just recently started following your blog and love the projects you have posted. I'm a new quilter and would love to add to my stash! Thanks for the chance. I would love to "refresh" my stash! Found your blog on a great day! I'm a new follower! Great fabrics! Thanks for a chance to win! What a great idea to giveaway those fabrics you don't think you'll use. I love the sock monkey fabric!!!! One of my nieces is trying to get pregnant. This would make a great gender neutral quilt. Thanks for the chance to win!!!!! rawdesign1956(at)gmail(dot)com. Ooh - what a great bit of random fabrics! I'd LOVE to win. I'm in the process of starting up an etsy shop and can't use enough fabric right now. What a great stash! Would love to win some pieces! Thanks for the chance to win such amazing fabric. What a generous giveaway. I love the sock monkey prints in the mix (and the bananas!). Great collection of fabrics, would love to add them to my stash. Thanks for the chance to win. Thanks for the chance to win all of the colorful fabric! Thanks for the chance to win! I'm working on charity quilts so if I won I'm sure some would make an appearance in one of those. Awww, what lovely fabrics! Great way to destash ♥♥ Thank you for the giveaway! Oh please pick me!! I really love that farmdale blossom! Wow! A great giveaway, and congrats on almost hitting 1000! That's awesome! Thanks for the chance. What a fun giveaway! Thanks for the chance to win! I love giveaways like this!! As I am new to quilting my stash isn't much so these would be greatly appreciated.. Thanks for the chance to win some fabric. I would love to win some of your fabric, and I could really use it! Thanks for the opportunity! This is such a wonderful, generous giveaway! Thank you! I'm from Australia, but do have a U.S. address to provide you. I understand about the shipping costs. Isn't it funny that the Internet makes the world smaller, but then international shipping prices make it seem bigger again! Your stash extras are adorable! Would love the chance to have some. Looks like some fun fabrics in there! I finally talked my younger sister into quilting. I would love to give her some material to try out. Ooo, I would love to win. I'm a beginner quilter and don't really have a stash yet, though I am working quite hard on it. I'm in the process of finishing my 4th quilt, and am really wanting to try one of those ticker tape quilts by AmandaJean over at Crazy Mom Quilts. Thanks for such a wonderful giveaway. What a lovely destash! It's all gorgeous, but I am particularly drooling over the black fabric with berries in the middle stack. So pretty! Thank you for the chance to win! Thank you so much for the chance! I recently moved and am just getting my area in order so am looking for a new project and some inspiration! I'd love to win! I buy mostly half yards, and still manage to run out of prints I love! But I've learned to keep in mind that there is ALWAYS new fabric coming out, and there will be something new that comes along that I will fall in love with next! I love scraps! Hope I win!! So happy that your doing this both ways. I am new to quilting and am trying to build stash as I can but I seem to use what I get pretty fast. I would love to win this and would be happy to pay the shipping. Thanks for the chance. Thanks for the chance to win some great scraps! Wow! What a great giveaway! Thanks for the opportunity to win.